South Ponto Beach is a rare gem in that it is one of the widest beaches in the county and exists in an undeveloped area. Coast Hwy 101 hugs the shoreline here, with Batiquitos Lagoon on the other side of the highway. The beach is a popular family destination, and only one of the few beaches in the area that has public restrooms and showers. South Ponto Beach is secluded with its high sand dunes and tends to have a lot of polished stones washed up during the winter time. South Ponto Beach offers a full ray of activities, including swimming, surfing, sunbathing, and beach volleyball. You’ll have to bring your own net. The beach is a popular surf spot with occasional surfing events. 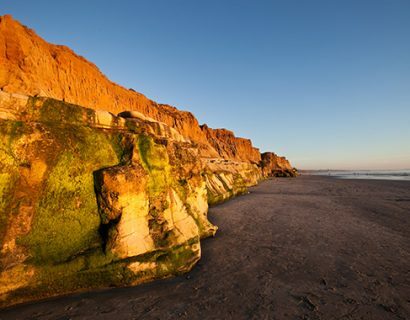 If you happen to be driving on Coast Hwy 101 by this beach during sunset, you might find it irresistable to park on the highway shoulder and walk onto the sand to enjoy the captivating colors, wide stretch of sand, and water pounding on the jetty. 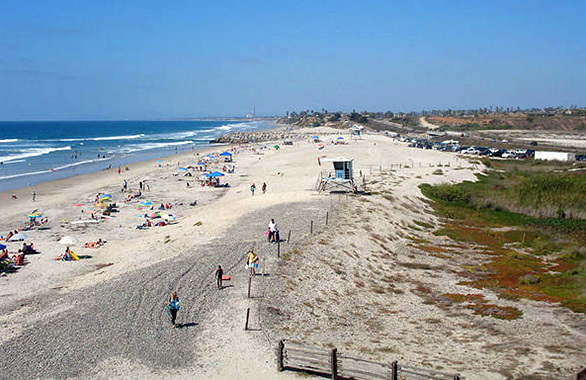 South Ponto is on the south end of South Carlsbad State Beach, and just south of Batiquitos Lagoon jetties. South Ponto Beach is just north of Leucadia, where the bluffs end and the open stretch of ocean begins. Dogs not allowed. Dogs are allowed leashed, on The Strand, the frontage road. No alcohol, No glass bottles. At the southernmost end of South Carlsbad is a pay lot ($8 per vehicle during peak season). There’s actually a limited amount of free parking on the outer edge of South Ponto Beach. South Ponto Beach is open 6 a.m. to 10 p.m. 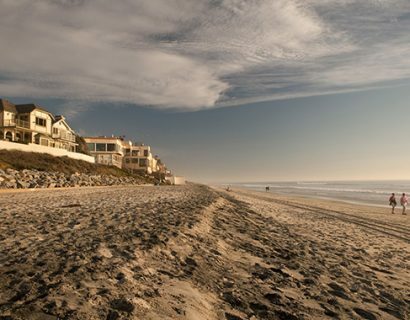 In all, South Ponto Beach is one of the few undeveloped beaches in the county. That along with the extra wide sand makes this beach a popular haven for families and other beach goers.